Protestors cross the Roberto Clemente bridge during a evening rush hour march that began in downtown Pittsburgh Friday, June 22, 2018. 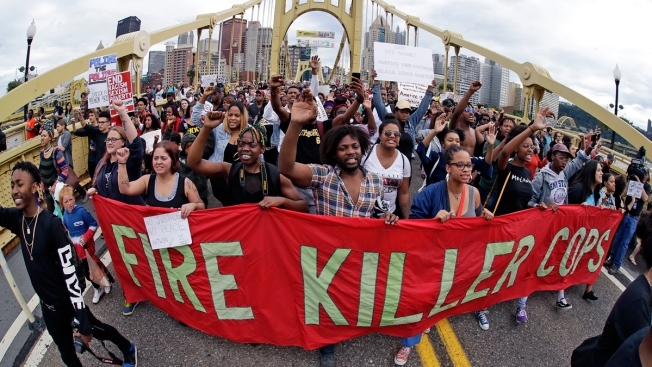 They are protesting the killing of Antwon Rose Jr. who was fatally shot by a police officer seconds after he fled a traffic stop late Tuesday, in the suburb of East Pittsburgh. Experts say there's been a shift in the way authorities are handling police-involved shootings in minority communities, NBC News reported. Prosecutors are bringing charges that take into account both witnesses and videos, while simultaneously acknowledging that they are going to have a difficult time going to trial and obtaining a conviction, said Philip Stinson, an associate professor of criminal justice at Bowling Green State University. He added that he believes police investigators and prosecutors are giving more weight to witness statements than they did previously. In the recent shooting deaths of both Antwon Rose of East Pittsburgh, Pennsylvania and Anthony Marcel Green of Georgia, it took just one week for the officers to be charged. The officer who shot Rose was charged with homicide; the officer who shot Green was charged with voluntary manslaughter.